I just started evaluating of Teiid. I try to use it in our new product. Now I could sucessfully create and deploy a VDB with Teiid/Teiid Designer 7.1 to federate two Oracle data sources. But I do not know how to write Update Procedure for INSERT/UPDATE/DELETE. Is there any samples available? You can see the documentation on the "update" procedures here. I read the documentation and the two requests. They are helpful. My question is I cannot find the entry point in Designer to create Update Procedures. In all the "update", "insert" and "delete" tabs in the Designer, you can define a Teiid procedure that will is reflective of the actual insert, update and delete you want to do. But I could not find the tabs in Teiid Designer UI. I am tried Eclipse 3.5 and 3.6 with Teiid Designer 7.0/7.1 respectively. 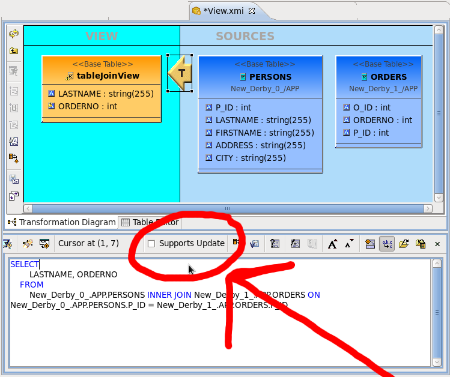 I can create procedure from the view model UI. But I do not know it is Virtual Procedure or Update Procedure. Would you please kindly give some guide on this silly question? Look into Transformation diagram of the specific view.